As part of the Government of Serbia’s commitment to address the significant health inequities between Roma and majority populations, the Ministry of Health and the Ministry for Human and Minority Rights, Public Administration and Local Self-government held a Roma health forum in Belgrade on 28–29 February 2012, and adopted a national declaration on Roma health. The aim was to review progress in and challenges to Roma health in Serbia and beyond, enable participants to exchange experience and learn from good practices, and define ways to improve Roma health. WHO, the United Nations Children’s Fund (UNICEF) and the Organization for Security and Co-operation in Europe (OSCE) supported the event. The participants comprised representatives of governments and Roma civil-society organizations from selected countries participating in the Decade of Roma Inclusion. 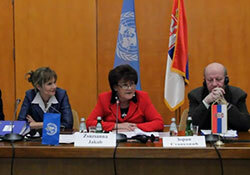 Speaking at the forum, Zsuzsanna Jakab, WHO Regional Director for Europe, emphasized that greater health equity for all, including Roma and other populations experiencing poverty and social exclusion, is at the heart of the new European policy framework, Health 2020, now under development. “WHO is committed to working to ensure the highest attainable level of health for all; this is our raison d'être, enshrined in the WHO Constitution. We welcome joining forces with you to make Health 2020 a success and improve Roma health throughout Europe,” she commented. Taking place a month after a conference on Roma health convened through the Presidency of the Decade of Roma Inclusion, now held by the Government of the former Yugoslav Republic of Macedonia, the Belgrade forum furthered the call for increased action on Roma health in both Serbia and the other countries participating in the Decade of Roma Inclusion. identifying and removing barriers to health-system access experienced by some Roma, including those related to lack of financial protection and of documentation. In addition, participants highlighted the opportunities for increased exchange between countries of know-how and promising practices on Roma health. They noted the Decade of Roma Inclusion, as well as the European Union’s Integrated European Platform for Roma Inclusion and the South-eastern Europe Health Network supported by WHO/Europe, as important means for increasing such cooperation among countries. Recognizing that health care is a human right is part of the Serbian constitution. In 2005, the Government adopted a series of health-related laws that require health services to be physically, economically and geographically accessible, and to respect patients’ right to access health services without discrimination. In 2010, the Ministry of Health and the National Health Insurance Fund ensured that Roma, including non-citizens, had the right to access the health system. The Ministry established a system of health mediators to work with the Roma communities and liaise with the health services: 75 mediators are deployed to 59 municipalities throughout Serbia. With the Government of Serbia and other international partners, WHO/Europe is part of the Sustainable Work Management Initiative for a Healthier Tomorrow (SWIFT), which aims to improve Roma health by addressing its social determinants.